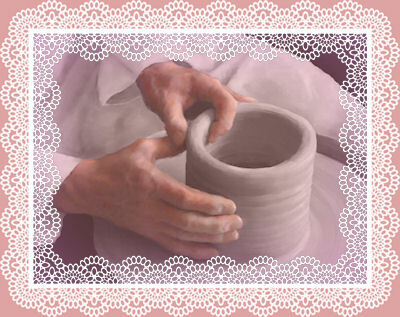 "But now, O LORD, thou art our father, we are the clay, and thou our potter, and we all are the work of thy hand"(Isaiah 64:8). God created a man (and a woman) for earth’s population who could recognize Him, respond to His Love and allow Him to guide and direct them for the rest of their lives. He also gave them the ability to accept or reject their God. God’s Love for man demanded that he have free will and not be just a puppet whose strings were pulled by God’s Kingdom. Angels were made available as “ministering spirits” for earth’s inhabitants, but their ministering could be ignored, and man could drag himself away from their protection. His decision to reject the relationship that God provided and intended would lead man to his own destruction. To enable man to have godly pursuits, God made Himself known to man by His Word. In the beginning of creation, the Word was audible and passed to each generation verbally; but eventually as man recorded God’s Word it became available to the whole world in written form, inspired by the Holy Spirit who makes the Word recognizable as God’s “voice.” His Word is more than an arrangement of letters of the alphabet; it is the inspired written voice of God Himself. As Man became acquainted with God through His Word, he was expected to implement a two-way conversation with God. In fact, God not only expected it, He greatly desired it and looked forward to a close relationship with Man. In spite of the “disconnect” in the Garden of Eden when Man listened to Satan and lost that intimacy with Him, God’s desire didn’t diminish. A plan was already in place to thwart Satan’s destructive attempt to win Man away from God. The plan involved the dearest thing in God’s heart—His son! The oneness of the Trinity evidenced itself when God, the Holy Spirit, caused a young lady to become pregnant with God, the Son, to fulfill the will of God, the Father. They were all with one accord in the plan to redeem Man and restore the relationship God intended from the beginning of earth’s creation. To enable Man to know Him better, God brought tests periodically to Man to motivate him to get to know God by learning everything he could about His Kingdom. He made His Word available to Man with explicit instructions, expectations, methods of communication, praise and worship—all of which would enhance the God-Man relationship and assure Man of help on earth and a home in Heaven. God didn’t need to test Man so He would know how faithful Man would be; being omniscience, He already knew. He tested Man so Man would know his weaknesses and where he was vulnerable in order to allow God to shore up the places of danger where Satan could slip into Man’s life and draw him away from God into destruction. How can we tell if we are being “tested” by God or “tempted” by Satan? The Holy Spirit is gentle; God woos. Satan pushes. God provides opportunity to choose; Satan says, “Just do it--now; don’t worry about consequences until later.” Well, he is more subtle than that, but essentially that is what he means no matter how he says it to our mind. He will use the method that works best with each individual. God tests Man with the goal of maturity and strength; He NEVER tempts Man with sinful intent! Satan tempts Man with sinful intent with destruction as his ultimate goal. We can’t blame God when we are tempted to sin! “But every man is tempted, when he is drawn away of his own lust, and enticed (James 1:14). God’s “school” is to teach us to be more like Him, not conformed to this world. Consider life as a classroom and the Holy Spirit its teacher. God’s textbook library is complete for every lesson. He brings experiences to us that are to send us to His library again and again to learn more about how to act and react to the lesson. Our responsibility: Be faithful in testing and wisely aware of Satan’s temptations! Therein is our victory! Oh how I long to be like Him.